This is the kind of salad you don't feel bad about shelling out nine bucks for at a cafe. It won't leave you hungry and every bite tastes like heaven. It's the kind of salad you THINK you can't make for yourself. But OoOO you CAN! See, I think I've finally cracked the code to those bougie cafe salads. It's that combination of fruit, nuts and cheese that sets their salads a bar above the rest. Think about it. Strawberries, apple, mango? Cashews, almond slices, walnuts? Blue cheese, parmesan, feta? It can be yours! In a nonstick pan, toast walnuts on medium low heat until they begin to brown. Chop and set aside. Fillet the chicken breasts and lightly pound with a mallet or the bottom of a sturdy glass. Season both sides with oregano, basil, salt and pepper. Fry the breasts in the pan with olive oil on medium heat until cooked. Remove, allow to rest, then cut into strips and set aside. Put arugula into pan and briefly toss until slightly wilted then place in a large serving bowl. Slice apple and add to salad. Crumble feta over the salad and add walnuts. In a small bowl, combine lemon juice, vinegar, garlic and slowly pour in olive oil while whisking together. Season with salt and pepper. Pour dressing over the salad and toss. 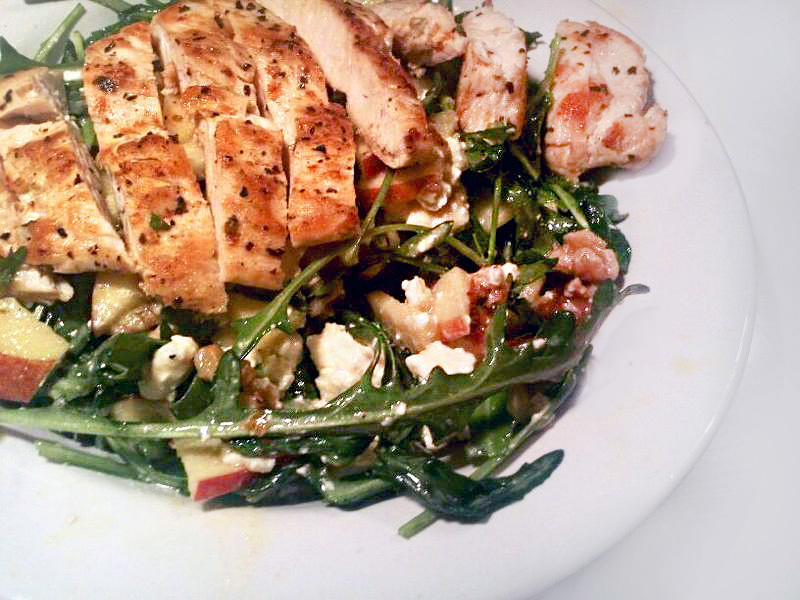 Plate the salad and add the slices of chicken over the top.